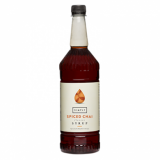 Monin Winter Spice syrup in 70cl stylish glass bottle. For many, the thought of winter is less joyful, as it brings cold and darkness. However, these cold days can be much better, if one thinks of the many treats that can only be enjoyed properly during the winter time. Whether hot chocolate or mulled wine, the right spice mixture gives us inner warmth and gives us a real "feel-good" moment in the face of the cold. The Winter Spice Syrup by Monin gives your drinks and desserts the right kick, which is especially appreciated on cold days. Taste: flavours of ginger, nutmeg, cloves and chilly. Sugar, Water, Concentrated Lemon Juice, Natural Flavouring, Natural Cinnamon Flavouring with other natural flavourings, Colouring Agents: Caramel (E150a), Anthocyanin (E163), Natural Cloves Flavouring, Natural Pimento Flavouring, Emulsifiers: Acacia Gum (E414), Glycerol Ester (E445), Preserving Agent: Potassium Sorbate (E202).